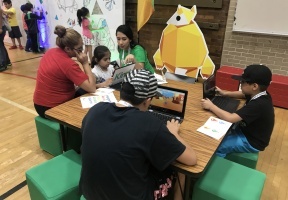 Google, in partnership with the Instituto del Progreso Latino, hosted a fun, educational, and interactive event for Google’s Be Internet Awesome / Sé genial en Internet program. 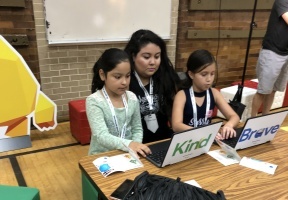 To help Chicago families address the growing need for online safety information and help close the internet safety education gap, Google’s Be Internet Awesome program provides English and Spanish resources needed to talk to kids about digital safety and citizenship—both at home and in the classroom. The Be Internet Awesome is Google’s free multifaceted program designed to teach kids the fundamentals of digital citizenship and safety so they can explore the online world with confidence. The program is available in English and Spanish and consists of an ISTE standards aligned curriculum, ready-made Pear Decks for each lesson, Interland – an adventure-packed online game about digital safety and citizenship, and plenty of resources for educators and parents. The program has a been awarded the Seal of Alignment by the International Society for Technology in Education. The Be Internet Awesome Curriculum gives educators the tools and methods they need to teach digital safety fundamentals.